From the beautiful view of the water with its sandy beach and waterfront dock, to the light and bright interior of this great cottage, this is the complete vacation package. We liked so much about Rowe’s Den and are delighted the owners have decided to share it with you. 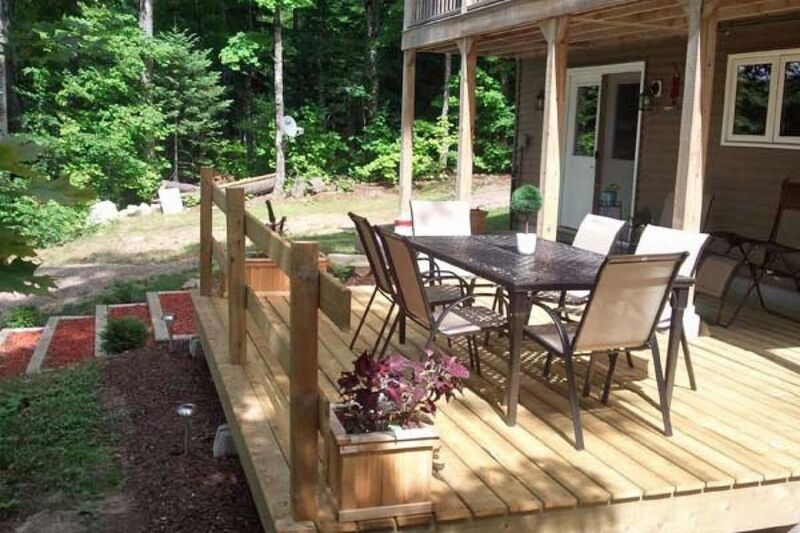 Located just 30 minutes east of Bracebridge, the property offers a true Cottage Country environment yet is a short drive from shopping, restaurants and attractions in the Muskoka region. Bird Lake is about 6 Kms down a well-maintained road off Hwy 118 and the 3-yr old cottage is easy to reach. Perennial gardens and an attractive deck are welcoming features and there is plenty of parking for up to 3 vehicles. Inside the cottage there is a tiled hallway with the master bedroom off to one side and a full bathroom to the other. The hallway leads into the spacious and well-equipped kitchen and dining area with an attractive table that has seating for 8. To the other side is a carpeted living room with comfortable L-shaped seating and a wall-mounted TV and there’s plenty of books and games for keeping guests occupied on the occasional rainy day. Two more bedrooms, one with a private deck, and a second bathroom with a shower are on the upper floor. A door off the dining area opens onto a small deck where you’ll find a barbecue and to the other side a screened sunroom where you can sit in the wicker furniture and enjoy the sunsets with an aperitif. On the lower level a Foosball table and dartboard offer more indoor activities while you’ll also find a range of water toys and noodles for enjoying the water and a walkout to the waterfront. The waterside is a delight with steps leading down to a wooded area where there’s a firepit, a waterfront deck with gazebo and dock. The sandy beach area will be popular with children of all ages, and the shallow walkout to the water gradually deepens for great swimming in clean and clear water. The owners provide 2 kayaks, a canoe and a pedal-boat so the whole family can putter about on the lake together. This is a lovely cottage in a gorgeous location and we are sure our guests are going to love it as much as the owners do.